If you want to get your hands on a pair of Apple’s hot new AirPods wireless earbuds, you have two choices. You can either order them on Amazon, where you’ll have to pay a premium but they’ll ship right now, or you can order them from Apple and wait more than a month to get them. You might be after the cool cord-free design rather than the Apple logo, however, in which case you should check out the ZIYUO Twins Wireless Bluetooth In-ear Earphones. 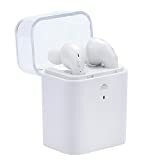 They look just like AirPods, they fit better since they use rubber tips, and they cost just $40 on Amazon. Superb Sound Quality headset with Bluetooth V4.1+CSR for best stereo sound and superb bass sound. Clear high & low volume. Best wireless earbuds sound.With the built-in mic you can easily take calls. With hight capacity lithium battery and low frequency balanced technology funtion,Intelligent charging box provides fast charge, worry free for endurance.